You are at:Home»Orthodox News»MAKE CHRISTMAS GREAT AGAIN! By Frank Marangos, D.Min., Ed.D. Christmas was once America’s preeminent national holiday. First celebrated in the year 98, it was forty years later before the early Church officially adopted Christmas as an annual Christian festival. It was not until the fifth century that the day of its celebration became permanently fixed on the 25th of December. Up to that time it had been irregularly observed at various times of the year. Originally banned in the United States when, after the American Revolution, it was considered an English custom, Christmas was officially recognized as a national federal holiday by Congress and signed into law by President Ulysses S. Grant on June 28, 1870. Over the past few decades, however, the annual celebration of the birth of Jesus of Nazareth, the Divine spiritual leader whose teachings form the basis of the Christian religion, has gradually been supplanted by more inclusive and commercialized adaptations. In an effort to mitigate the chance of alienating non-Christians, the more diplomatic expressions of “Happy Holidays” or “Season’s Greetings” have entered the season’s lexicon of popular salutations. As a result of multicultural sensitivities and political debates over secular-religious tensions, the ranking of the Nation’s once dominant holiday has now been eclipsed by other annual observances. Like Donald Trump’s trademarked slogan, initially coined by candidate Ronald Reagan during his 1980 presidential campaign, Christmas, like America, can and should be made “Great Again!” In fact, many firmly contend that the “greatness” of America’s cultural, economic, and defensive sensibilities are closely interrelated to the simultaneous reemergence of the Nation’s Judeo-Christian pedigree. 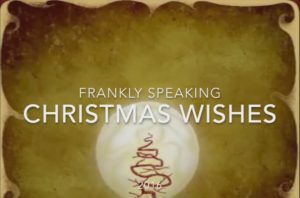 While such assertions may generate bitter disagreement, at the very least, frank and intelligent conversations concerning the Nation’s founding identity and its Christmas tradition would be instructive and culturally cathartic. Remarkably, a wonderful commentary for inaugurating such discussions is an animated television program. Based on the Peanuts comic strip created by Charles M. Schulz, A Charlie Brown Christmas made its debut on CBS on December 9, 1965. Having received Emmy and Peabody Awards, the film went on to become the longest running holiday special in television history. This is how to make Christmas Great Again! Only by honestly acknowledging and courageously re-wrapping the holiday’s fundamental message, the “good tidings” (Luke 2:10) of peace, forgiveness, and selfless altruism around its roots, can we, like Linus, hope to strengthen our Nation’s drooping economic, civic, and religious branches. Most Americans can identify with Charlie Brown’s desire to heal a feeble sapling that, in the final analysis, is a reflection of personal as well as societal vulnerabilities. The country’s psyche intrinsically understands that, left on its own, its branches cannot support the high-minded ornamentation that civic, business, and even religious leaders desire to hang on it. In the end, when honestly reflecting on its condition, the Nation like humanity, does in fact recognize its need for a Redeemer, a Comforter, to provide much needed reinforcement. Nonetheless, while each citizen can freely choose how and if to celebrate, the truth of the matter is that Christmas is and, to this point, remains a Christian-inspired national holiday whose hope-filled message, no amount of historical amnesia or social deconstruction can distort. Each year, on December 7, two days before the original debut of A Charlie Brown Christmas, the United States fortuitously commemorates the infamous 1941 attack on Pearl Harbor. The World War that was tragically precipitated by the attack exemplifies the degree to which humanity needs the Christmas message of peace, forgiveness, and good will to heal humanity’s spiritual as well as geo-political discords. Here, the story of Mitsuo Fuchida, Japan’s most decorated Imperial Navy pilot and officer who led the surprise attack on Pearl Harbor shouting “Tora, Tora, Tora,” is illustrative. The remarkable life-story of Fuchida was first published in Readers Digest in 1954. According to the Japanese Captain’s own words, his entire wartime obsession was based on a “growing hatred” towards America. “After that morning (December 7),” he said, “I lifted the curtain of warfare and put my whole effort into the war that followed.” While Fuchida’s life was spared many times during the war, his hostility was forever changed when he met Jacob DeShazer, an America pilot who was captured, tortured, and subsequently motivated to return to Japan to preach the Christian message of forgiveness. A changed life is strong evidence for the transforming power of the Christian faith. Like DeShazar, Fuchida’s hate infested heart was rehabilitated by the love and grace of Christ. As a result, in 1950 the notorious Japanese pilot was baptized and spent the remainder of his life as a Christian missionary until his death in 1976. This is the message that can make Christmas Great Again! Linus is correct. Christmas is indeed a time to rededicate ourselves, families, and Nation to the motivations of peace, forgiveness, and good will among all people. Christmas is more than carols, cards, and cookies. Sparkling snow, romantic fireplaces, eggnog, sleigh bells, toys, and tinsel cannot be permitted to sponsor the primary message of the season. Christmas is about God’s love and faithfulness made tangible through history. Through the Incarnation, the Creator became a creature, the Mighty One became a vulnerable infant whose self-sacrificial life goal was to redeem the cosmos. In the end, this is the story that has left humanity to wonder and awe about redemption not reindeer, holiness not holly. While the redemptive message of Christmas has remained the same for nearly 2,000 years, its origin predates the announcement at a cave-hewn manger. Referred to as the Protoevangelion (first gospel) by early Christian theologians, the first Christmas message was not preached by an angel but by God Himself. He is the One who first announced that because of the enmity created by sin between people, creation, and God humanity needed a Redeemer. The Garden of Eden was the sanctuary . . . Adam, Eve, and a coiled, frightened serpent were the congregation. The Good News was that the “seed of the woman” would one day “bruise the serpent’s head” (Genesis 3:15) and liberate humanity and all creation from enslavement. Eden, Bethlehem, and Golgotha must be appreciated together as the Holy Nativity of Jesus, and, therefore, the Christmas holiday itself would be completely unnecessary were it not for sin. Humanity’s distorted image is the tragic backdrop against which the glorious first Christmas message in the Garden of Eden was given. Understood in such a comprehensive fashion, the authentic message of Christmas is revealed. God humbled Himself and became a helpless infant to grow up and conquer death, hell and the sting of sin by stomping on the serpent’s (satan’s) malevolent head. This is the primordial story of virtue’s triumph over evil, of light over darkness, of forgiveness over bitterness, of love over hate from which all other human narratives receive their inspiration. A few years ago a prominent northeastern newspaper announced the unconventional recall of a cookbook. While automobiles, toasters, and baby seats are often recalled due to mechanical defects, cookbooks are not normally the focus of such retractions. Nonetheless, the cookbook in question was recalled because of a particular recipe that had inadvertently omitted an important ingredient. The publishers realized that if the recipe was followed as printed the remaining ingredients could actually blow up in a cook’s face. Because of this inherent hazard, the cookbook was recalled. America has always aspired to be a Nation of peace, forgiveness, and love. Such ornamentation, however, cannot be hung on feeble branches, but humbly displayed on limbs made sturdy by what Linus’ blanket represents. This is the primary Message, the ingredient that the Nation should not omit during it’s cultural journey to the Bethlehem manger. Jesus is the supporting blanket, the Comforter, the vital ingredient of the Season! This is the lesson that the Charlie Browns of society must come to appreciate. Linus is correct – this is what Christmas is all about. This is how to make Christmas Great Again! Next Article Where is American religion heading?